Italy are concerned about their Friday's match against Costa Rica, who came from behind to beat Uruguay 3-1. Italy can’t afford to celebrate too much after opening the World Cup with an impressive win over England. The Azzurri have to recover physically after a draining match in the jungle venue of Manaus and prepare to face a surprising Costa Rica side. They also have to guard against their tendency to play poorly against lesser-known teams and to struggle in the second matches of major tournaments. “The second match is decisive,” coach Cesare Prandelli said after the 2-1 win over England on Saturday. On Sunday, the Azzurri flew back down to their training base in Mangaratiba. But they will have to travel north again for Friday’s match in Recife against Costa Rica, which came from behind to stun Uruguay 3-1 and start a tough Group D with a major upset. Costa Rica and Italy each have three points to top the group and Italy will enter its next match as a clear favorite. 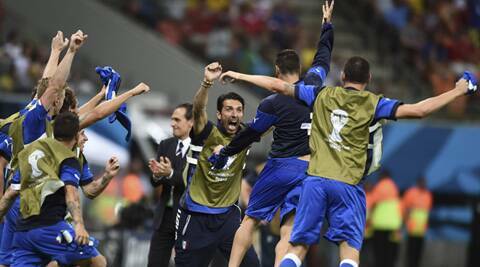 However, the Azzurri were also full of confidence after drawing 1-1 with title-holder Spain to open Euro 2012. They went on to struggle in their second match, also drawing 1-1 with Croatia, and then needed a 2-0 win over Ireland to be sure of advancing. Even in 2006, when Italy won its fourth World Cup, the Azzurri opened with a 2-0 win over Ghana only to draw 1-1 with the United States in their next match and again struggle to get through. And in 2010, things went from bad to worse from the first match to the second. After a 1-1 draw with Paraguay, the Azzurri were held to an embarrassing 1-1 draw by New Zealand before then being eliminated by a 3-2 defeat to Slovakia. Making matters more complicated this time around is the climate. According to FIFA, it was 30 degrees C (86 degrees F) with humidity at 61 percent for the England match and Prandelli criticized organizers for not allowing time outs. Midfielder Daniele De Rossi echoed Prandelli when he said that it was “absurd to play a World Cup opener in these conditions. “Now we’ll see if we need to make some lineup changes to help recuperate,” De Rossi added. Prandelli might use Lorenzo Insigne to add some spark on the left wing, where Italy struggled on Saturday. Mattia De Sciglio could return at left back after sitting out the England game with a muscle strain, and center back Gabriel Paletta could return to the bench after struggling to stop England’s physical forwards. Most importantly, Prandelli has to examine the condition of captain Gianluigi Buffon, who also sat out with an injured ankle. Salvatore Sirigu performed admirably in goal in Buffon’s absence but Buffon can take Italy to another level. Prandelli was pleased with the play of fullback Matteo Darmian and attacking midfielder Antonio Candreva on the right wing. Candreva set up Balotelli’s goal and Darmian showed poise despite making his international debut just two weeks ago in a warm-up match with Ireland. What Prandelli wants now is to avoid a letdown against Costa Rica.